Thirty years and sixteen books after her sensational debut novel, The Lady of Hay, took the reading world by storm, Barbara Erskine returns to the same atmospheric location for a gripping tale of love, loss and conflict. Hay-on-Wye, a beautiful town nestling near the Black Mountains at the tip of the Brecon Beacons, is famous for its annual books festival but its landscape has also become familiar to millions of readers who have lapped up Erskine’s groundbreaking time-slip novel since its publication in 1986. In this thrilling new standalone story, featuring two women, four centuries apart, united by an ancient, rambling house in the windswept Welsh Marches, Erskine uses her now irresistible, trademark blend of history, mystery, romance and frissons of spine-tingling supernatural to woo a new generation of readers. The year 1400 was a landmark in Welsh history as nationalistic fervour became centred on their long-awaited ‘Son of Destiny’ Owain Glyndwr. His mission was open rebellion, a vicious fight to the death, a war that would free his land from the yoke of English rule... forever. In March of that year, war is brewing in the Welsh borders. 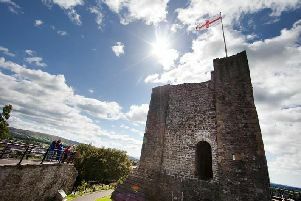 For two centuries, Wales has been trapped under English rule while its people dream of winning back their independence. Finally, it looks as though the charismatic Glyndwr, whose birth was heralded by a comet in the sky, may be the man of legend who will bring them victory. At the old fortified manor house known as Sleeper’s Castle, Catrin – young, intelligent and gifted with ‘the sight’ – is on the brink of womanhood and falling in love for the first time. Her widowed father Daffyd is a poet and soothsayer, a man of words who can inspire loyalty, or incite revolt. Daffyd is embroiled in a dangerous game, playing on the mixed loyalties and furious rivalries between Welsh princes and English lords. Soon Catrin finds herself caught in the middle of a doomed war as she is called upon to foretell Wales’s destiny… and what she sees is only blood and conflict coming closer. In Hay in 2015, Miranda (Andy) Dysart from London is grieving for her partner of ten years Graham who died recently. Now homeless, she has moved into Sleeper’s Castle to house-sit for a friend in Australia and to escape the vicious threats of Graham’s unhinged, estranged wife Rhona. Slowly Andy finds herself gaining new hope and coming to life again in the wild, unspoilt solitude of the mountains. But every time she closes her eyes, her dreams of an ancient past become more vivid and she is drawn back to a time when neighbour was set against neighbour, father against son. Erskine works her special magic as fact and fiction, the past and the present are woven together seamlessly in a powerful story brimming with high drama, bone-chilling menace and soaring passions. Written with the author’s acute sense of time and place, the mesmerising plotting skills which enable her to draw together the two young women across 600 years of history, Sleeper’s Castle is a rich, enchanting saga and an exciting successor to the unforgettable Lady of Hay.